Smelter Overseer's House is a small home in Markarth, that is home to Mulush gro-Shugurz, the Smelter Overseer, and Urzoga gra-Shugurz. The Overseer's House is tucked away behind a rocky outcropping. Initially, it can be very easy to overlook the stairs leading up to it while standing in the smelting area. * This person works and sleeps in Cidhna Mine. There is a small vegetable garden to the east of the smelter outside consisting of two cabbage plants and three potato plants, with a basket containing two potatoes in front of it. The entrance is normally novice locked. 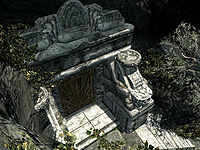 It is a single story Dwemer style dwelling built into the side of the hill. There are stone shelves on either side of you as soon as you enter. On the shelf on the right is a pickaxe, knapsack, barrel containing mead and a crate with a piece of silver ore on top. While on the shelf to the left is a food barrel, two bottles of alto wine, a cabbage, a potato and a basket containing a gourd, two more potatoes and a leek, with an anvil and bucket containing two pieces of silver ore to the right of the shelf. Coming out from the east wall is a long stone table with a stone chair on either side and two silver ingots, a bottle of alto wine, a leather strip, a wolf pelt, a pair of iron gauntlets, a steel war axe and a sluice gate key on top of the table. Opposite this is a fireplace on the west wall with a cooking pot hanging in front and a raw rabbit leg, a cast iron pot containing a cabbage and carrot, and a kettle containing a joint of raw beef, a cabbage and three potatoes all on the hearth. To the right of the fireplace is a rabbit on a wooden block and a food barrel with a couple of pieces of cheese on it. Hanging from the ceiling above is a rack holding a rabbit, pheasant and bunch of dried elves ear. To the left of the fireplace is a pile of firewood with a woodcutter's axe leaning against the firewood. To the south the room narrows, with an iron dagger on a crate with a food sack beside it, to the east, before a round wooden table and chair with a baked potato and pheasant roast on top, with an iron sword stuck into a bale of straw opposite, against the west wall and a pickaxe on the floor nearby. Further south it becomes a corridor to a junction with a door to a bedroom to the west and alcoves to the east and up a couple of stairs to the south. On the east wall, just before the junction is a set of shelves holding a sheaf of wheat, a cabbage and a few food sacks. In the alcove to the east is an unlocked chest containing minor loot. Between the door to the bedroom and the alcove to the south is a round wooden table holding a bottle of Nord mead, a sample of slaughterfish scales and a sample of scaly pholiota. There is a set of shelves against the rear wall in the alcove to the south holding two loaves of bread, a gourd, a bottle of alto wine, a bottle of wine, a bulb of garlic and several pieces of cheese, with another food barrel and sacks to the left. Through the door is a bedroom consisting of a single owned bed in the southwestern corner with a ledge along the south wall holding a wolf pelt, a small coin purse, a leather strip and a bowl of troll fat. Opposite the door against the west wall is a small square wooden table with a bottle of wine and a bottle of Nord mead on top. To the left of this is a crate with a bunch of juniper berries in a wooden bowl on top. with an unlocked wooden chest against the east wall with two silver ingots on the floor beside it. This page was last modified on 8 September 2018, at 19:56.